Deliver butterfly kisses and wonderful wishes to friends and loved ones with the Butterfly Kisses Cling Stamp Set! Four delightful and beautifully scripted sentiments offer you a wonderful selection of well wishes for a multitude of occasions, while an ornate butterfly illustration lends itself as a sublime accent to flutter nearby! The perfect pairing to create a touch of whimsy on your next card front, scrapbook layout or altered art paper project! Approximate Image Sizes: 1. So Thoughtful Sentiment: 4.0" x 0.75", 2. Butterfly Kisses Sentiment: 4.25" x 0.50", 3. Celebrating You Sentiment: 4.0" x 1.0", 4. Fluttering By Sentiment: 4.25" x 0.75", 5. Butterfly Accent: 2.5" x 3.75". These cling stamps are ready to use with Acrylic Blocks. Included with stamp set: 1. Storage panel for use with a two or three ring binder, 2. Stamp packaging can also be used as a storage box for the stamp(s). Cling stamp from Carabelle Studio featuring an Origami Butterfly. Clear stamps featuring butterflies and the sentiments "With Love", "Dreams", "Wings", and more. Designs by Sheena Douglass. Acid & lignin free. These versatile and easy-to-use stamp sets are a great way to create beautiful and elegant cardmaking projects. To use these stamps simply peel them from the backing sheet and place onto a acrylic block (not provided) ink the stamp up and stamp. Once you are done simply peel the stamp off the acrylic block and wipe clean with an alcohol free baby wipe or wash in soapy water, leave to dry and return to the clear backing sheet. Fran's Curio Rubber Stamps are sweet, colorful, wooden sculptures ideal for decorating your crafting area or giving to crafty friends. On the back of each, you'll find a matching rubber stamp in our finest gray rubber, closely trimmed, with black foam cushion for the Stampendous impression you've come to expect from our products. Butterfly Stretch measures approximately 4"w X 2"h X 1-1/8"d and stands on its own. Artist Laurel Burch strove to create images that would remind people of the ongoing world of the spirit. Magical, beautiful images that will give you the freedom of expression to color and enjoy. Image measures 4" X 2.75". Features a pretty butterfly. 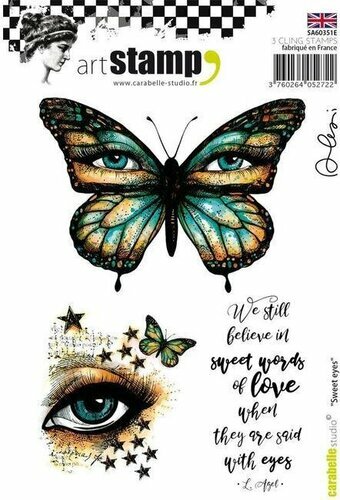 Cling stamp from Carabelle Studio featuring butterflies. A butterfly themed Penny Black rubber stamp. Cling stamp from Carabelle Studio featuring Steampunk style gears and butterfly. 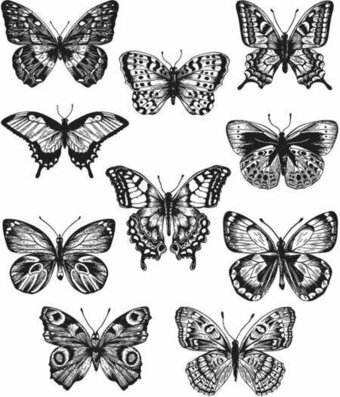 Creative Expressions: Butterfly Elegance Butterfly Icons Clear Stamp Set. A necessity stamp set if you love butterflies. This set include 5 different sizes and 2 different styles =10 stamps! One style has a reversed pattern on them...Get great effects with heat embossing! 10 stamps. Size: Smallest: 0.60" x 0.50", Largest: 2.0" x 1.50". Ten deeply etched red rubber cling mount rubber stamps that adhere to any clear acrylic block. Butterfly (upper left) measures approximately 2 3/16" x 1 5/8". Stamps come on a 3-hole punched sheet for easy storage. These butterfly cling stamps are designed with a water colour look. Includes 2 stamps; 2.5 x 2.1 in and 2.1 x 1.7 in. Take a leisurely stroll through French Flea Market, where you will discover a gorgeous treasure trove of one-of-a-kind patterns and vintage-inspired designs. In a shabby-chic palette of cottage blues, soft pinks and warm neutrals, French Flea Market will bring a cozy, cottage vibe to all that you create! This stamp set includes the Eiffel Tower, Paris postage marks, a butterfly, "Hello Beautiful", and "You Are Special".